Where we live, the home or dwelling that we are sheltered in, should give us comfort, identity, and an outlet for creativity. 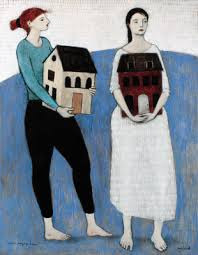 I believe everyone has that right and need to have a home, not only to be shielded from tempestuous weather, but to be cradled in a haven or refuge. No matter how old we are, we grow up there--hopefully learning what we are supposed to understand in the span of time we live within its walls. To feel a sense of place is vital and transforming--to know that you belong somewhere and it belongs to you. To love a place, a home, and the walls that built you, is a hard thing to leave or shed. We all need a sanctuary to grow and love in. As Laura Ingalls Wilder says in the Little House Series, "I have discovered that home is the nicest word there is." These pictures, by one of my favorite contemporary artists, Brian Kershisnik, show how I feel sometimes. Since I am a vagabond these days, the top picture shows two women (if I can read their expressions), trying to trade houses. One woman seems willing, and the other one appears to be rethinking or pondering the costs/stipulations of the exchange. I am not sure I see a swap in the making. Do you? Will the other be willing to encounter a new place that can create needed change--even a reinvention of a new self? For some people, it is the obligation or choice to grow in the same place, to stretch and grow, without the physical change of place. But for others it is the duty, and perhaps desire, to periodically rearrange oneself. Different chapters and stages of our lives necessitate the need to trade homes, and even discard them. Another of Kershisnik's paintings shows a woman with a kick of glee and satisfaction. 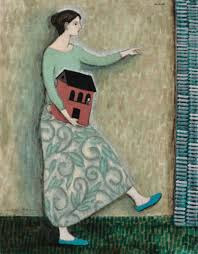 It looks like this woman has found a home--a place she can call and make into her own. Since I lived and worked in refugee camps in the 1980's in Southeast Asia, I am painfully aware of the terror and exploits of some who must escape from their beloved homes. Their faces, struck with fear and helplessness, live with me, haunt me, because I remember their sense of homelessness. All their familiarities had been snatched from them, and their only home was their loved ones. I remember the hammocks that swayed breezily and the crowded bamboo mats on the three-sided cement structures of their temporary, makeshift homes. I know that not everyone has a home, a sanctuary. I have been a roamer this summer, and it has evoked memories of people who endlessly wait for a home to call their own. When I came back to the Middle East from my roamings this summer, I counted that I had slept in 20 beds since I left Doha in June--in Airbnbs, college dorm rooms, cabins, family and friends' homes, hotels, and on the ground. I do not count the many plane rides. Each time I was treated with the utmost graciousness, all while knowing I would eventually be settled in in my new home in Doha. This new chapter of being an expat, after 19 years in the same abode, sometimes still has me a little bewildered. I was very accustomed to the cozy, comfortable, customary walls that sheltered me for so long. 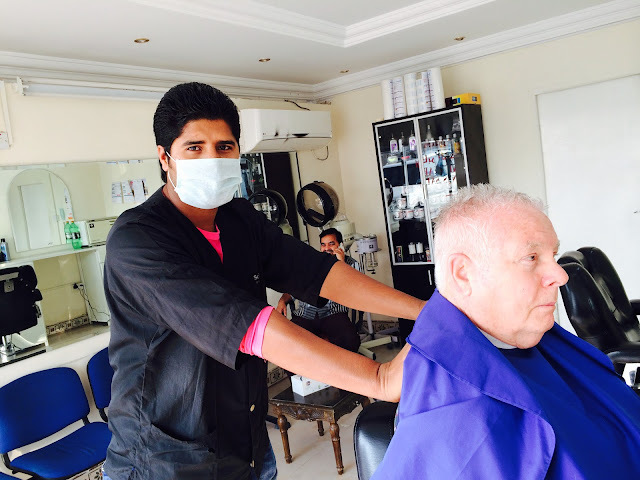 But when I entered into my expat home here in Doha a few nights ago, I felt a sense of relief and comfort. I am home: where I awaken to the call of prayer, embrace women who wear burqas, and listen very carefully to dozens of accents as we strive to communicate in English. After being one year in the Middle East, I have learned that I can do more than just adapt or adjust, I can be joyfully happy--living among unfamiliarities. I can be friends with strangers whom I do not know yet. Last year's post about my old "homestead." to be warmed on arctic nights and desert wanderings. pieces in the collage make one. In my quest to reconcile how to cherish all the homes and peoples that created me, I will continue to tuck all the memories of other refuges in my pocket. I cannot let them go, for they are as a part of me as my eyes or ears. However, I now know after living here in the Middle East for one year, I can enlarge the pocket--to include a whole array of additional homes in my collection. For you see, I am a gatherer.... But if I could choose my most favorite "home", I would tell my husband what Jane Eyre said to Mr. Rochester, "Wherever you are is my home--my only home." He is my most treasured home of all in the collection. A common sight at this particular mosque in the neighborhood is a pick up soccer game. My new home, to the left. My dear neighbors from Jordan live next door. My neighbor told me we are "sisters," and I completely agree. This is Ala, my seven year old next door neighbor, from Jordan. She is the ball girl for our tennis class. Love her too. She always, without fails, knocks on my door to see me, and calls out that she loves me from the street. Who would not want to live next to a neighbor like her? I married into a Wyoming family of devout Teton aficionados (my in-laws have The Tetons etched into their gravestone, and I suspect we will too). Since we were living back east for the first years of our marriage, I had never been to the Tetons until my husband and I were married a year or two. 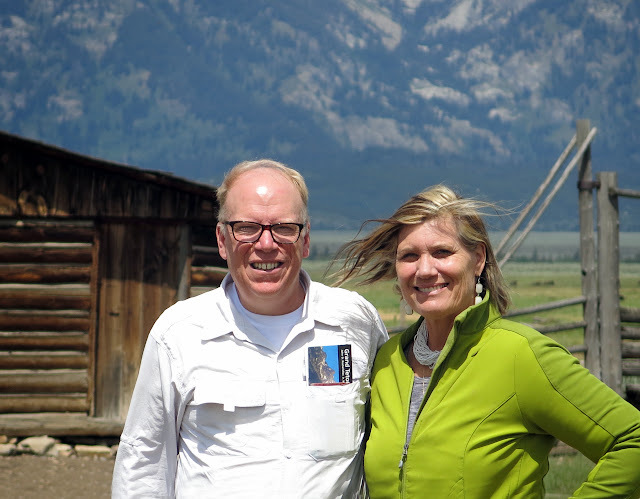 When we got close to the mountain range in Grand Teton National Park on that first trip together, my husband blindfolded me, grasped my hand, and waited for my gasps of wonder and rapture. I did not disappoint his anticipation of amazed emotions. And to tell you the truth, the awe of their splendor has still not escaped me--even more than three decades later. The Teton mountains are what Teddy Roosevelt said, "what mountains should look like." I agree. The Teton peaks are cathedrals in the clouds, granite pinnacles that inspire me in every season. Their rugged crevices that are speckled with snow and coniferous trees are a towering reminder of the majestic beauty of our world. They fill the human spirit with intrigue and awe--making us not only want to be a better steward of the earth, but also a better person. Those peaks have also at times almost spoken to me, if I could hear their voice, calling out to hang on, and to take courage. A picture that I asked my good friend, Steven Chamberlain, to paint for me--to remember that morning when the dawn truly came a new day in The Teton Valley. Those towering peaks, even if they are far in the distance, can coach and mentor you. 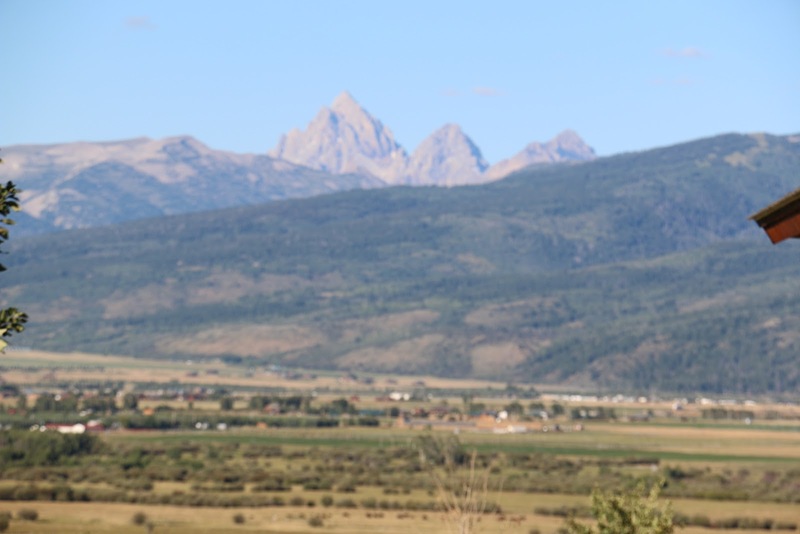 In the years since my first glimpse of The Tetons, their tutoring has given me surges of courage and faith that I could do harder things than I thought otherwise. 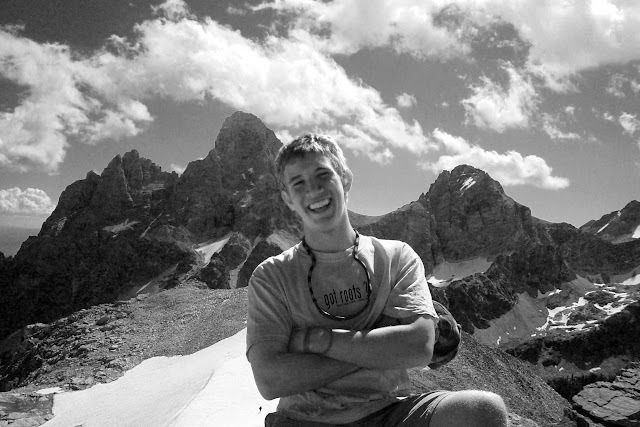 Being in the Teton Valley on the Idaho side, with the gentle rolling hills in front of the Tetons, I realized that I could climb "my autism mountain." I will never forget climbing in the early morning on a mountain there, overlooking the Teton Valley at sunrise. The sunlight dripped into my downcast heart that had been parched and crackly dry for about a year after my son's diagnosis of autism. However, since that morning, a new and hopeful morning, I have tried to continue to "climb the autism peaks" and never look back. The Tetons, as shown from the Idaho side, with the rolling hills in front. 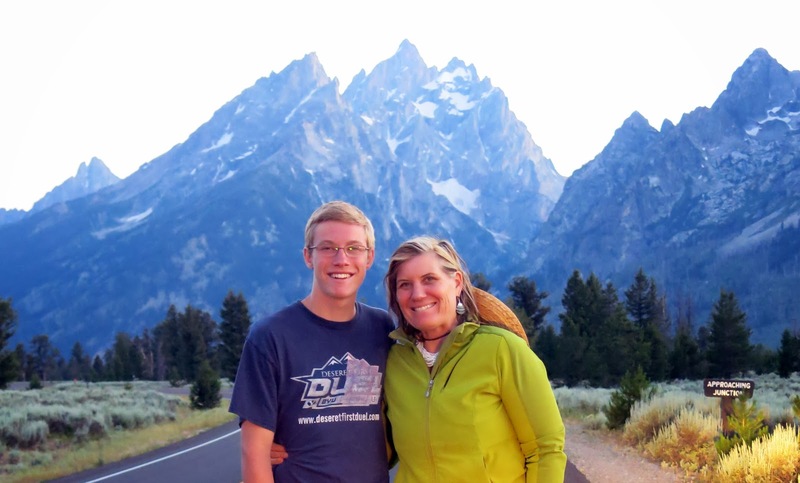 This summer, on the Wyoming side, with the stark, bold views of the Tetons in the clouds and sun rays, I took courage that I could face an illness that a loved one was experiencing. The entire four days that I was there in the Teton National Park, I tried to glimpse the peaks in every angle, distant and close, allowing them to soothe my fears. And the peace came. For some reason, those summits in the clouds give me hope that I can climb higher; they give me more pluckiness that I can surmount any paths that have unanticipated turns. Again, these peaks were my friends, constant and steady. 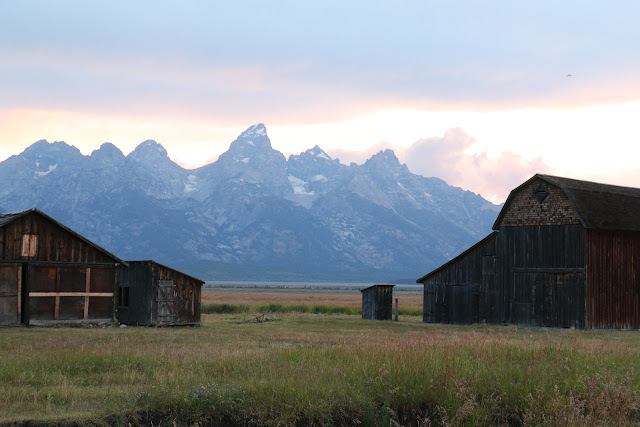 The Tetons in the background, with the famous Mormon Row barns in front on the Wyomingside. In the Jackson Hole, Wyoming Visitor's Center, near the gateway to the National Parks, there is a quote by Edward Abbey that reads: "Wilderness is not a luxury but a necessity of the spirit." Yet the wilderness of the Grand Teton National Park almost did not happen; it was one of the most controversial national parks that was ever established in the U.S. The history of how it finally came to be, after several decades in 1950, makes me proud of someone whom I have never met: my husband's grandfather. His tenacity, sacrifice, and love for those peaks showed dogged determination to preserve them when the people around him did not have the same vision. As Wyoming Commissioner for Fish and Game and later in Eisenhower's cabinet as Undersecretary of Interior, he made some political enemies because of his life long desire to increase the Grand Teton National Park that was originally established in 1929. He sided with John D. Rockefeller Jr. that the land should be preserved when Rockefeller slowly bought 35,000 acres around the winding Snake River--near the Teton mountain range. Within this letter, it outlines his involvement in the expansion of the Grand Teton National Park. To be a Wyoming mountain man, canvasing the Teton range as a boy and then working for the government in preserving the land, he went against his own Wyoming friends and neighbors to expand the Grand Teton National Park. Somehow people like Lester Bagley knew how precious those abruptly vertical, jagged peaks would be to our human spirits generations later. came to be. He did not seek recognition, but his outspoken voice to combine the land of the already formed park in 1929 (with Rockefeller's gift of 35,000 acres in 1950) helped to enlarge the park--making it the sublime place it is today. In the Ken Burns series entitled, The National Parks: America's Greatest Idea, there is a interview with Terry Tempest Williams who currently teaches Environmental Humanities at the University of Utah. Her thoughtful words echo my own love for the Grand Tetons. In the interview, she states, "Everybody has a favorite national park, whether it is Yosemite, the Great Smokies, but for our family it is The Grand Tetons." Yes, and it is for our family too. The Teton landscapes are living, breathing friends, tutoring me in all seasons--giving me moments that are divine, majestic, sublime. I mark them dear to my heart, where all the best tales are stored.